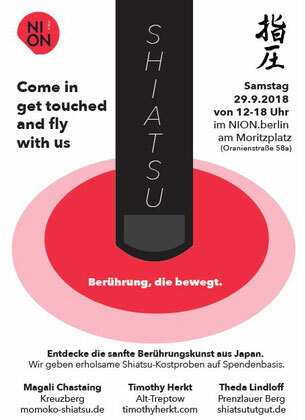 Shiatsu is not very well-known in Germany. Some think it is a martial art, some think it is a very hurtful massage! This is why we organise the Shiatsu Days with the German Society for Shiatsu. We want you to have the opportunity to discover the incredibly relaxing and refreshing effect of shiatsu, and that it not painful, but very enjoyable! This event is donation-based and open to everyone. Come without registration at Nion Base and say hi! It will be nice to meet you!